F4 Ski and Snowboard fluorinated paste wax for all snow conditions. Apply, polish and go! Good wax to use on the fly. Keep it in your pocket and you can use it whenever the snow feels slow. 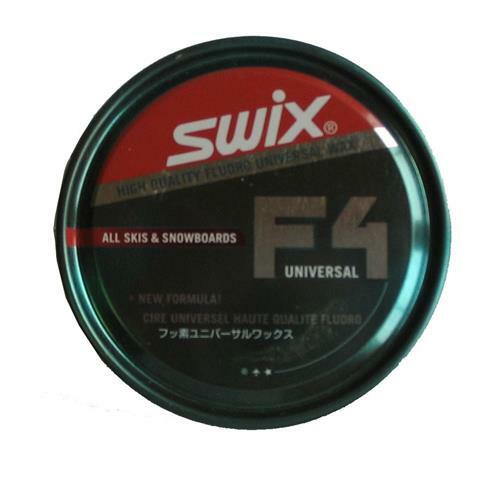 This wax is a great solution to sticky snow on the slopes. I will usually head to the parking lot, apply a quick coat, and I'm set!! Pros: Small. Portable. Smells great. Cons: Does not last long, sometimes I quickly rewax after lunch. Quick, Easy, Convenient. Especially good for milder, spring skiing weather, wet snow. makes a huge difference with glide factor for skis. Goes on Quickly like shoe polish. I can wax a pair of skis in 3 minutes. Apply, Buff w polishing cloth. Pros: smells great too!, well dont make it a habit!! Swix F4 universal wax comes in several application styles, my favorite is the tin seen here, small enough to carry and not worry if i yard sale it exploding in my pocket. Saved the day many times when the snow got a bit sticky and kept me moving in carving bliss!